Johan Boberg was born in Stockholm, Sweden 1971. At the age of 9 he started playing guitar. At 16 he switched over to bass guitar and started playing jazz, intensly listening to John Coltrane. 18 years old, while at Framnäs music school in Piteå, following a newly gained interest in conteporary classic music he started composing his own music. Inspired by Olivier Messiaen and Karlheinz Stockhausen he composed his first works under the supervision of his first teacher Fredrik Högberg. Back in Stockholm a few years later he continued his studies with Johan Hammerth. 1994-2000 he accidentally became a part of the Internet revolution. During this period he also took his first steps towards electronic music. In 1996 he started taking classes in electro-acoustic music production at EMS. Though in the following years, after the birth of his first child and being totally absorbed with the ever accellerating internet revolution he let music composition rest and advanced to Chief System Architect after being a software developer for some years. In the year 2000, when the inflated internet business spectacularly exploded he picked up where he had left off, continuing his classes at EMS. His second child was born in 2001. The same year he attended the Stockhausen Courses for New Music in Kürten near Cologne in Germany. Since then he has followed a straight line towards finding his own voice. Soon he started performing live electronic music as well as producing pure studio creations. His music has been performed regularly in Sweden at Fylkingen, Kulturhuset, Museum of Modern Art and other places. Internationally in Germany, France, England, Poland, Mexico and Italy. As a live electronics performer he performs solo as well as in different constellations such as the "Synthi Duo" with fellow composer Jonas Broberg. 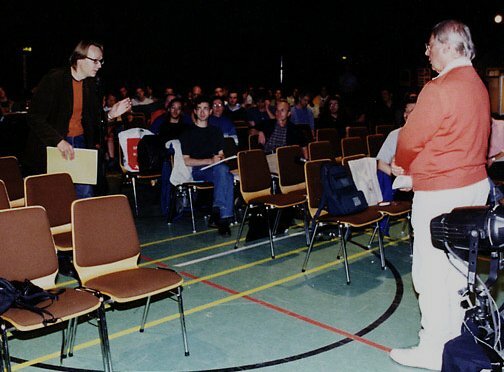 Johan Boberg was the chairman of the composers society at EMS 2004-2006. He was a member of the artistic advisory board at EMS 2005-2007 and is a member of Fylkingen. As an author he has written articles for the Swedish magazine for contemporary music - Nutida Musik.